Frida meets a mysterious girl making snow angels in the woods. When the quiet town of Deerpoint, Vermont is hit by the biggest blizzard in over 100 years, a mysterious girl named Eva steps out of a snow bank and into the lives of 15 confused teenagers who are asked to help her in her search. What Eva’s searching for, and who she truly is, becomes a mystery that baffles and energizes the teens of Deerpoint. The play unfolds through the reading of journal entries and interactions among the students over the course of a single snow day as the students meet in a shed near the sledding hill, in the pretzel shop, and in their travels around town. 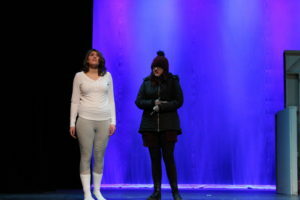 Snow Angel is a funny and eerie tale of teen angst and the power of believing. 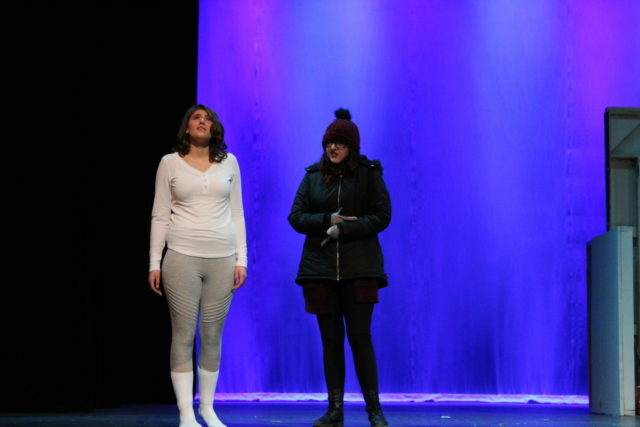 The play begins with all of the teenagers waiting by their radios, listening to the school closings. Just as they hear their school is closed and they begin to rejoice, their teacher has a special announcement for them – they have a journal assignment over the Snow Day. “Who has homework over a snow day?” they wonder as their spirits drop.